Add lemon juice to milk. Set aside. Slice bananas in lengths, about 1/4 inch thick, long across the bananas. Toss with lemon juice and set aside. In a medium bowl, whisk together milk/lemon mixture, eggs, melted butter and vanilla. In a separate bowl, mix flour, sugar, baking powder, baking soda, salt and ground almond flour. Add dry ingredients to wet ingredients. Mix until smooth—but do not over mix. Set aside. Melt butter in a skillet. Add brown sugar and melt together. Stir in bananas and sauté until tender and warmed through. Sprinkle with cinnamon. Remove bananas from heat and pour rum over top. Ignite with a long match; baste bananas until flame extinguishes. 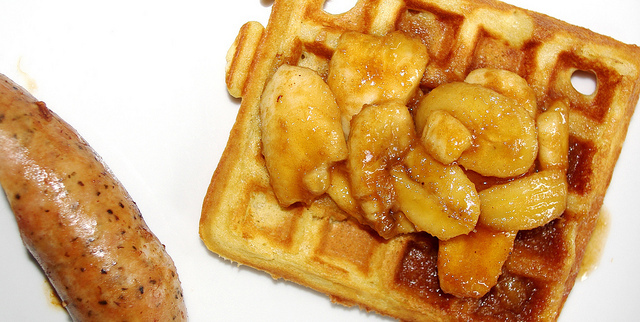 Pour banana mixture over waffles and serve warm.